The Bridal Flowers Makeup Bag is an ideal cosmetic bag by the Bagettes company. This bag is big enough to carry your lipstick, eyeliner, keys and other essentials. Large enough for all the essentials for the bride and her bridal team to hold the basics for a quick touch-up. Compact enough to not be the main conversation of the fashion. After all this is the bride's day. She wants everything to look just right. 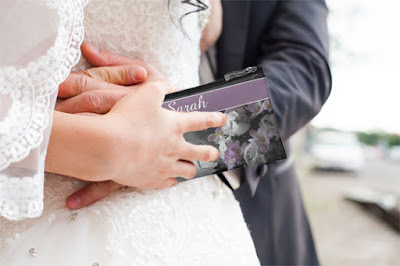 The last thing the bridesmaids want to do is carry around a large purse. This cosmetic sized bag is ideal to fit in a handbag and it makes it easy it find those cosmetic items without having to search through the bag. I love this design of the white high heels and the beautiful flowers with a hint of color. Personalize it with your name or the name of your friend. Give this as a gift at the rehearsal dinner to your bride team as a thank you gift. Bought a Bagettes Cosmetic bag Satin for a Christmas present. Loved the soft satin fabric exterior and the interior had a nice nylon finish. The print design was vivid and I was quite impressed with the quality of this bag. The review is shown here. Zazzle has nine style options for this bag. The small cosmetic bag is the bag that is shown here. On the same order page, you can change it to a mini clutch, the wristlet or the travel accessory bag. Hit the "Customize It" button to make sure that it fits exactly the way you would like your bag to look. A few months ago, our daughter had gotten married. She had given out small bags to her matron of honor and her bridesmaids to show her appreciation. This bridal bag from Bagdoll Gifts on Zazzle compliment any fashion and color of the bride and bridal team gowns. Learn how to blog for money with Pajama Affiliates.